You came here for french fries, and french fries you shall get … but first something fun! On Easter I was given a very special award from the very lovely, and talented beyond belief, Half Baked Baker! So, I am passing this award on to the following eight bloggers because they have been so kind, and because their blogs are absolutely delicious!! There are so many other bloggers I enjoy reading, and my blog roll on the side is a rotating list of the ones I check out on a regular basis. Check them out along with the eight above because they are very good reads! And now … back to fried foods!! I’m from the South, and there is a belief in these parts that food is better deep fried. While that may be true there is one food that, when deep fried, reaches the pinnacle of what it can be. 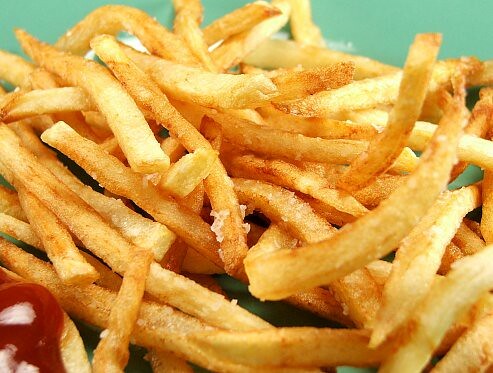 Crisp yet tender, firm yet yielding, the french fry is the ultimate fried food. As a society, as a culture, we can do far better than the fast food french fry. It is not difficult to make delicious fries at home. All you need is a deep pot, peanut oil, some russet potatoes, and salt. Well, and some ketchup. 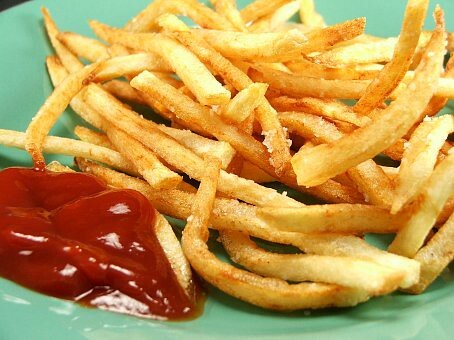 I love hot french fries and ketchup. It is the mouthwatering combo of tangy and salty. Mmmmm. So, break out your fry pots and slice some potatoes. We are frying tonight!! 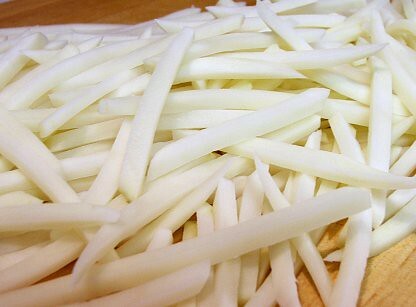 Rinse the cut potatoes in a collander until the water runs clear. Put the potatoes into a bowl, cover with water and add ice. Refigerate for an hour. Heat the oil over medium low heat, with an deep-frying thermometer, until the oil reaches 325F. 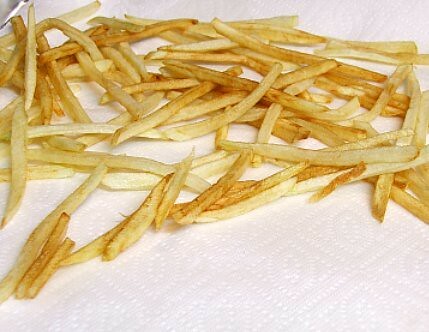 Prepare a sheet pan with a few layers of paper towel for draining the fries once they are cooked. Strain the potatoes and pat them with a clean dish cloth, or paper towels, until they are very dry. 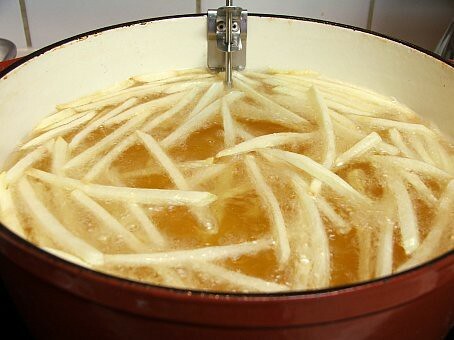 Drop the fries, by the hand full, into the oil and cook until they are golden and soft, about 4 – 6 minutes. Remove from the oil and drain on the paper towel lined sheet pan. Repeat with the remaining fries. Let the potatoes drain for at least twenty minutes or up to an hour. 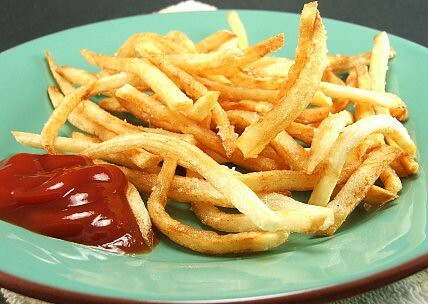 Increase the heat of the oil to 375F and cook the par cooked fries for 1 – 2 minutes, or until very crisp and golden. Remove from the oil and immediatly season with salt. Enjoy alone or with the dipping sauce of your choice. I like plain old ketchup!